1. Lyamichev, V.; Brow, M.A. ; Varvel, V.E. ; Dahlberg, J.E. 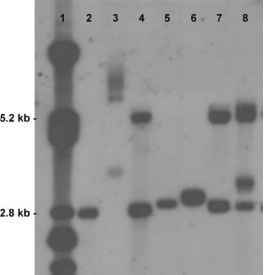 Comparison of the 5' nuclease activities of Taq DNA polymerase and its isolated nuclease domain. Proc. Natl. Acad. Sci. U. S. A. 1999, 96, 6143-6148. 2. Lie, Y.S. ; Petropoulos, C.J. Advances in quantitative PCR technology: 5' Nuclease assays. Curr. Opin. Biotechnol. 1998, 9, 43-48. 3. Mackay, I.M. ; Arden, K.E. ; Nitsche, A. Real-time PCR in virology. Nucleic Acids Res. 2002, 30, 12921305. 4. De Angelis, D.A. Why FRET over genomics? Physiol. Genomics 1999, 1, 93-99. 5. Lyamichev, V.; Brow, M.A. ; Dahlberg, J.E. Structure-specific endonucleolytic cleavage of nucleic acids by eu-bacterial DNA polymerases. Science 1993, 260, 778783. 6. Holland, P.M.; Abramson, R.D. ; Watson, R.; Gelfand, D.H. Detection of specific polymerase chain reaction product by utilizing the 5'-3' exonuclease activity of Thermus aquaticus DNA polymerase. Proc. Natl. Acad. Sci. U. S. A. 1991, 88, 7276-7280. 7. Lee, L.G. ; Connell, C.R. ; Bloch, W. Allelic discrimination by nick-translation PCR with fluorogenic probes. Nucleic Acids Res. 1993, 21, 3761-3766. 8. Livak, K.J. ; Flood, S.J. ; Marmaro, J.; Giusti, W.; Deetz, K. Oligonucleotides with fluorescent dyes at opposite ends provide a quenched probe system useful for detecting PCR product and nucleic acid hybridization. PCR Methods Appl. 1995, 4, 357-362. 9. Heid, C.A. ; Stevens, J.; Livak, K.J. ; Williams, P.M. Real time quantitative PCR. Genome Res. 1996, 6, 986-994. 10. Gibson, U.E. ; Heid, C.A. ; Williams, P.M. A novel method for real time quantitative RT-PCR. Genome Res. 1996, 6, 995-1001. 11. Kreuzer, K.A. ; Bohn, A.; Lupberger, J.; Solassol, J.; le Coutre, P.; Schmidt, C.A. Simultaneous absolute quantification of target and control templates by real-time fluorescence reverse transcription-PCR using 4-(4'-dime-thylaminophenylazo)benzoic acid as a dark quencher dye. Clin. Chem. 2001, 47, 486-490. 12. Kutyavin, I.V. ; Afonina, I.A. ; Mills, A.; Gorn, V.V. ; Lukhtanov, E.A. ; Belousov, E.S. ; Singer, M.J.; Walburger, D.K. ; Lokhov, S.G.; Gall, A.A.; Dempcy, R.; Reed, M.W. ; Meyer, R.B. ; Hedgpeth, J. 3'-minor groove binder-DNA probes increase sequence specificity at PCR extension temperatures. Nucleic Acids Res. 2000, 28, 655-661.